If you’re starting or running a nonprofit, you’re most likely aware of the rise in competition for donor resources over the past two decades. The Internet and online giving have increased the opportunities for smaller nonprofit start-ups to gain recognition and compete in arenas where larger nonprofits once solely existed. The rise in competition goes hand-in-hand with changes in the marketplace. There are now three unique donor generations in the marketplace with their own distinct behaviors, drivers and preferences. More than ever, donor relationships are being conducted and maintained online. Social media is increasing the reach of brand exposure, and whether you realize it or not, buyers are defining your brand, even if you aren’t. In light of these challenges, how can you successfully distinguish your brand and your voice to rise above the competition? First and foremost, you should know what success looks like. Why is your brand important to the world? What do you hope to achieve? How do you envision someone relating to your brand? 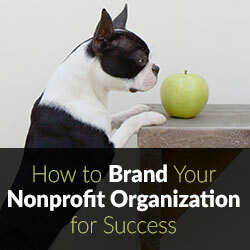 In addition, you should understand the purpose of your brand initiative. Are you overcoming an old brand, creating a new one, exploring new territory? Paint your picture of success, so that everyone inside and outside of your organization can share in your vision. So often, organizations get hung up on “what” they do and forget that audiences are more inclined to be motivated by “why” they do it. Hundreds, or even thousands, of others are likely doing “what” you do, but there is potentially only one of you doing it for the reason “why” you do it. Ultimately, your brand should help audiences understand where you stand and what you believe, so knowing why you do what you do and the underlying values that guide your beliefs are key to informing brand direction. Audiences are more inclined to connect with your message and brand when it relates to something they value. Donors value the idea that they’re making a difference, they value personal stories of success, they relate to living things and they look for signals that they can trust you. Having a clear understanding of what your audience values will allow you to shape your brand and relate in ways that they are most likely to notice, share and appreciate. Greater identification with your brand leads your audience to brand advocacy and, if nurtured, can grow to become increasingly passionate believers and brand evangelists. Good brand positioning should include a plan to communicate to your audience. When learning what your audience values, you should also be collecting information on the behavior and preferences of your audience. How does your audience learn about you? Where do they get their information? In which ways do they like to participate and how often? By collecting all the ways that an audience can engage with you through online and live experiences, you can consider whether you have the tools, platforms and communications necessary to usher an audience into deeper engagement. Are you giving your audience the tools to advocate and share your stories or events with others? Are those stories and events properly branded, and is there a call to action that drives them to take the next step? Considering these questions will help you build the plan that delivers your brand promise in a way that respects and reflects the values and passions of your audience. Isham Colosetti is co-founder and chief marketing strategist of Creative Mischief (www.creative-mischief.com), an Atlanta-based marketing agency with a multi-disciplinary team of award-winning marketing professionals who work to inspire memorable brand experiences. Over the past seven years, Colosetti’s creative and strategic leadership has made Creative Mischief a respected and trusted partner in a highly competitive landscape. In addition to his work at Creative Mischief, Isham is co-founder of the disruptive new comic book app, Farrago Comics, serves on the United Way of Greater Atlanta marketing committee and spends his spare time pursuing numerous creative and outdoor interests, including letterpress printing, boat building and fly fishing. He may be reached at (404) 477-6300 or by email at isham@creative-mischief.com.